Hachi walks with his master to the train station every day, goes home, and comes back to the station to meet his master’s train when he returns from work. But one day his master doesn’t return. Hachi goes home and comes back to meet the train every day for many years. His loyalty and devotion touch the heart of the Japanese people and change the life of a young boy named Yasuo forever. 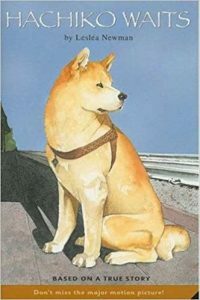 Based on the true story of the famous Akita who lived in Shibuya, Japan from 1923-1935, this is a must-read for dog lovers of all ages. Read “Behind the Film – Hachi: A Dog’s Tale” by Vicki Shigekuni Wong. I have always been an animal lover and when I was growing up, I had a wonderful dog named Angus who looked just like Toto in the Wizard of Oz. Because my relationship with my dog meant so much to me, I wanted to write a book about how a dog’s love and devotion can change a child’s life. When I heard the story of Hachiko, I was so moved, I knew this was the story I wanted to tell. 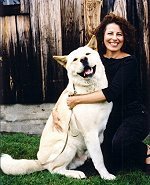 For a teacher’s guide to Hachiko Waits, please send an email to Lesléa with your name, the name of your school, and your school’s address. She will send it out to you right away! When Professor Eizaburo Ueno woke up, he liked to play a game with his golden-brown puppy, Hachi. He lay on his futon, not moving a muscle. He did not even open his eyes. Could he fool Hachi into thinking he was asleep? Not a chance. Hachi knew the instant his master was awake and told him so by pushing his cold, wet nose into the Professor’s hand. Hachi answered by wagging his fluffy curled tail back and forth with great enthusiasm. “I am glad you had such a fine night,” the Professor said as he put on his glasses and rose from his sleeping mat. “Now come along, Hachi. Let us start the day.” He motioned to the puppy who followed along as the Professor washed himself, put on a dark blue kimono, and headed downstairs to eat the breakfast his housekeeper had prepared for him before she left for the marketplace. The Professor entered the tatami room, walked across the straw mats covering the floor, and sat down on a cushion in front of a low wooden table. He poured himself a cup of hot green tea. As he lifted the steaming teacup, he looked up at a calendar hanging on the wall. The page it was turned to had a beautiful picture of a bright yellow sun rising over Japan. “April 1, 1924,” the Professor read out loud. “It is going to be a good day, little friend.” The Professor said this every day. He was a man of habit. Professor Ueno began to eat his breakfast of miso soup, dried fish and seaweed, rice, cooked eggs, and pickled radishes. His housekeeper had also set out breakfast for Hachi: a bowl of rice with miso soup poured over it. Hachi went over to his bowl, sniffed at it once, and walked away. He sat in the doorway and gazed at his master with a pleading look in his dark brown eyes. The Professor knew what Hachi wanted, but he shook his head. Hachi stayed where he was, and again the Professor knew what he wanted. Hachi played this game with him every morning. He was a dog of habit. He scooped up a tiny bit of rice with his index finger and held it out to Hachi. The dog licked his finger and began to eat. “Did you enjoy your breakfast this morning?” the Professor asked when Hachi was done. 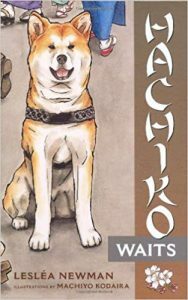 Hachi looked up at him with two grains of white rice stuck to his wet black nose. The Professor laughed. “Let me wash your face, little friend. You cannot go around looking like that.” He tenderly wiped the dog’s muzzle with the corner of his napkin. “What a handsome dog you are.” Hachi sat up tall and straight, basking in his master’s praise. Professor Ueno walked to the front entryway with Hachi at his heels. The genkan had a mat spread out along one wall, with several pairs of the Professor’s shoes lined up neatly upon it. The Professor stepped out of his house slippers and into a pair of geta, the wooden clogs he wore outside. Then together he and Hachi walked out of the house, across the front porch, and into the yard.